The rapidly expanding field of biology creates enormous challenges for data visualization techniques that enable researchers to gain insight from their large and highly complex data sets. The international Symposium on Biological Data Visualization (BioVis) is an interdisciplinary event covering all aspects of visualization in biology. The Symposium brings together researchers from the visualization, bioinformatics, and biology communities with the purpose of educating, inspiring, and engaging visualization researchers in problems in biological data visualization as well as bioinformatics and biology researchers in state-of-the-art visualization research. We invite submissions of original research articles, poster submissions, as well as submissions for a data visualization contest. Processes for interdisciplinary collaboration between biology and visualization. 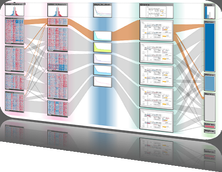 For 2014, the Data Analysis Contest will focus on the visualization and analysis of complex networks derived from resting-state fMRI (rsfRMI). These data define networks that possess physical locations, have physical connectivity that differs from physical proximity, and informational or functional connectivity that differs from both physical layout and physical connectivity. The contest focuses on how to better represent this data, so as to improve the utility of rsfMRI. For more details see http://biovis.net/year/2014/info/contest. Data Analysis Contest Entries: Submissions consist of several parts. These include: (1) a 250-word abstract; (2) a 2-page extended abstract describing the problem, your approach and results, suitable for evaluating the extendability of the entry into a full manuscript; (3) up to 4 additional free-text pages, summarizing the contestants' answer to the challenge, and methods/approach for producing the answer; and (4) a presentation (self-running powerpoint, keynote, or movie) demonstrating the approach and/or further explaining the entry. All accepted entries will be eligible for presentation at the symposium, either as short podium talks, or as data analysis contest poster or demo presentations. Data Analysis Contest entries deemed to make significant contributions will be invited to submit a manuscript to the thematic series on Biological Data Visualization of the journal BMC Bioinformatics, either as individual submissions, or as collaborative works collecting topically related submissions, at the recommendation of the judges. By submitting a Data Analysis Contest entry to BioVis, contestants license the submitted materials to BioVis for dissemination and/or use in BioVis promotional materials. The judges will select a winner and runner-up. A subset of selected contestants will have the opportunity to present their results in a session during the symposium, and entries that make significant contributions will be invited to submit a manuscript to the thematic series on Biological Data Visualization of the journal BMC Bioinformatics. All accepted entries will be eligible for presentation at the symposium, either as short podium talks or demo presentations. More information about each category of content and the various submission guidelines can be found on http://www.biovis.net. The symposium will be a two-day single-track event with keynote and invited talks, paper sessions, contest entries presentations, and posters/demos. Primers acting as tutorial introductions to visualization topics will be provided. At least one author of an accepted submission must attend the conference to present the work. When submitting your paper you will be asked to provide a complete list of authors even when submitting an anonymized version of the manuscript. This is required to avoid potential conflicts of interest when assigning reviewers. Adding additional authors after the acceptance of a paper is unacceptable and will not be permitted. All submissions will be treated as confidential communications during the review process, so submission does not constitute public disclosure of any ideas therein. Submissions should contain no information or materials that will be proprietary or confidential at the time of publication (at the conference), and should cite no publications that are proprietary or confidential at the time of publication. Contestants will also use the contest data in the spirit of academic collaboration and inquiry. The use of patented and proprietary solutions and software will be permitted for demonstrating the results in a forum at the Symposium. However, it is encouraged that the final submission include open-source code distribution and anonymized data to foster academic collaborations. Our symposium will adhere to the VGTC ethics guidelines for reviewers that can be found at http://vgtc.org/about_us/conferences/ethics-guidelines. Paper submissions will be managed by the Papers Chairs and sent to external reviewers - from both the visualization and bioinformatics communities - to evaluate the work’s novelty and significance. You have the option to have your work reviewed via a double-blind process; to do this, simply be sure to exclude all identifying information in the submitted manuscript file, ensuring that the reviewers will not know the identify of the authors. Otherwise, the review process will be single-blind, i.e. the reviewers will know the identity of the authors, but the authors will not know the identity of the reviewers. Poster submissions will be reviewed for relevance and interest to the BioVis community by the Poster Chairs. Data analysis contest entries will be reviewed for relevance by the Contest chairs. Accepted entries will be invited to present a contest poster or demo at the symposium. Accepted entries will further be peer-reviewed for contribution and technical merit by external reviewers from the BioVis Program Committee, and judged for awards by a panel of experts from relevant visualization and biological domains. Judges will evaluate submissions on criteria including, but not limited to accuracy, visualization or biological contribution, and design and usability, and will select winning entries, as well as recommend entries for short podium presentations and for invitation to a special issue of a journal. Entrants should note that accuracy will not be the sole determinant of judging, and that significant and novel contributions to specific aspects of, or sub-problems within the overall problem, will be viewed favorably. Entrants are encouraged to explicitly state their entries' areas of contribution to facilitate appropriate review. All deadlines are at 5:00 pm Pacific Time (PDT). Paper submissions can include full-color figures throughout. We encourage the use of digital video to enhance paper and poster submissions, particularly if part or all of the work addresses interactive techniques. Submission of working code and other supplemental material in order to increase the reproducibility of the work is also encouraged. The material for the contest entries should include all of the aforementioned content. It will be however, advantageous to include all material which will convince the reviewers of the specificity and topicality of the offered solutions. When possible, Open Source software should be provided for contest entries. Links to details and guidelines for preparing a proper submission and supplementary data can be found on http://www.biovis.net. Authors must follow the style guidelines specified therein. All accepted papers for the conference will be linked on the BioVis website (http://www.biovis.net) and will be made available through the IEEE Digital Library. In addition, all papers accepted for the conference will be considered for publication in the thematic series on Biological Data Visualization of BMC Bioinformatics. Decision about acceptance will be taken by the associate editors (i.e., the BioVis papers and publication chairs) and the BMC Bioinformatics section editor. Final notification about acceptance for the conference as well as the journal will be June 1, 2014. Authors will be required to meet costs required by BMC for open access; BMC can also provide waivers in cases where authors have troubles meeting these costs. All accepted poster submissions will be made available on the symposium website. Data Analysis Contest entries that are accepted, and deemed to make a significant contribution to the field, will be invited to submit full manuscripts for inclusion in the thematic series on Biological Data Visualization of BMC Bioinformatics. The best paper award aims to recognize papers that result from a successful collaboration between researchers from both the visualization and biology communities. Reviewers will be queried on the review form with a question "Should we consider this paper for the best paper award? (yes/no/maybe)". Posters will be assessed for rewards by a judging committee during the poster presentation session. Data Analysis Contest entries will be rewarded for creating either the best visualization among the competing entries, or for gleaning the most biological insights, and for other valuable contributions as identified by the judging panel. We also acknowledge the support by BMC. BioVis 2014. To contact the organizers please send an email to contact@biovis.net. © 2014. BioVis. All Rights Reserved.